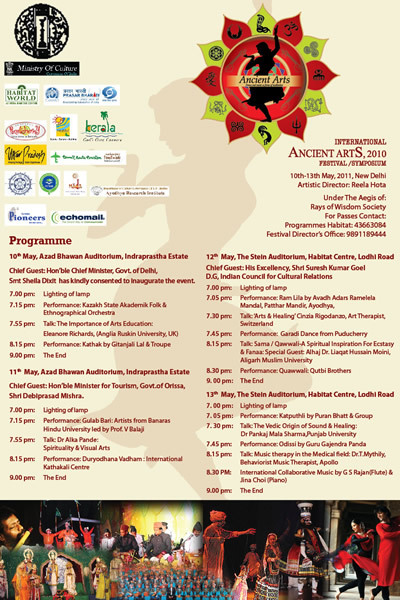 The International Ancient Arts Festival (IAAF) is also a symposium. It is an annual event organized by the Rays of Wisdom Society, the brainchild of Reela Hota. Why ancient Arts festival & Healing? Modern urban living has spawned a host of physical and psycho –social problems both at the individual and at the collective level. This has resulted in human society becoming increasingly ill, aggressive, and intolerant. Alleviation of such ailments through art and spirituality and the creation of a healthier happier society is the ultimate goal of our venture ‘Ancient Arts Symposium/Festival‘. It is with this vision to increase awareness for the need to encourage appreciation of art among people that this Festival/Symposium was conceptualized. 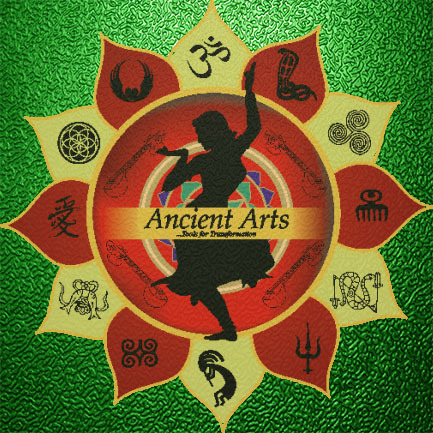 The Ancient Arts Festival is an array of multi-cultural dance and music presentations of performers while the symposium-sessions is dedicated to presenting research on the healing power of different ancient art forms. All ancient cultures recognized the deep relationship between creativity and spirituality and the healing potential of art. 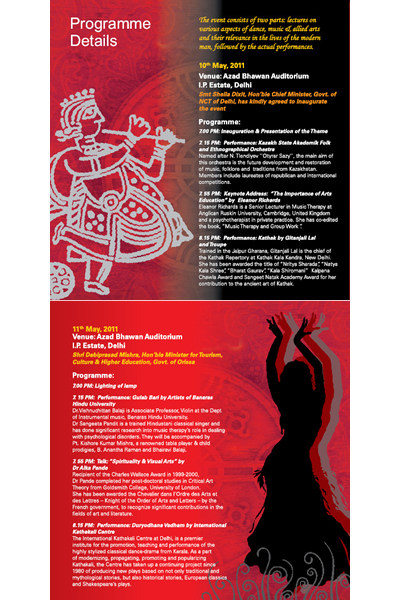 As the first ever international event of its kind in India, the symposium has had respected scholars and experts from reputed universities, from fields as diverse as music, dance, poetry, theatre, education and sociology, present their research on the effect of various arts on the human body. Renowned performers from cultures across the world participate in the festival. One of the Highlights this year was an International standard Opera of Ramleela with Artistes from Italy. Internationally acclaimed Fabrizio Daros is the Conductor while prize winning Maestro Marco Pucci Catena is the Director of the Opera. The Original Music score has been created by Antonio Cocomazi who has won 13 National & International Competitions and has recorded 7 CDs and 230 Works. Mattia Olivieri (Baritone), Raffaele Abete (Tenor) is one of the most sought Opera Singers in Europe while the talented Federico Benetti is the Bass. The Dance of Broadway USA is different because of the fusion of Ballet, Jazz & Modern which also blends in Acting and Singing and travelling from New York was acclaimed Dancer Jason Macdonald. 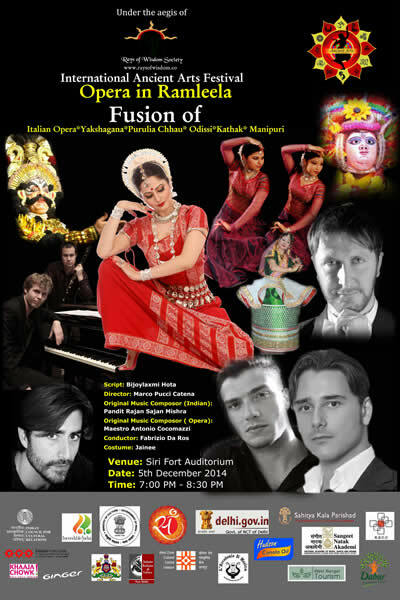 This was be the first time that Romanian ballet dancers of the Bucharest National Opera House performed in India. But that’s not all. They presented a unique fusion with Odissi danseuse and spiritualist Reela Hota to present a unique dance recital that was a significant highlight of the fourth edition of International Ancient Arts Festival/Symposium 2013 which was held at Kamani Auditorium, New Delhi on May 22 and May 23, 2013 . Highlighting the therapeutic benefits of music and dance in restoring individual health and harmony, this time the special focus of the festival was on ancient languages, in particular Sanskrit. The festival included a performance by maestros Pt Rajan-Sajan Mishra and a talk by Mandra Cromwell from USA, nominated for the Thomas Edison Award for her work in the field of cymatherapy. 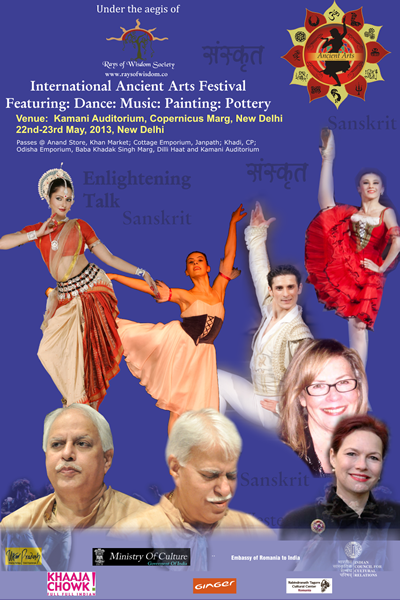 Theme: The Meditative Aspects Traditional Music, Dance and Allied Arts. The 3rd edition of IAAF was inaugurated on May 16 by Lt. Governor, H. E Tejendra Khanna. The performance began with a collaborative performance of various Indian traditional dances forms, highlighting the spiritual significance of Rabindranath Tagore’s poems, led by Reela Hota. The second performance of the evening was a soul-stirring Sufi music performance by Pakistan’s Ustad Hamid Ali Khan, a Pakistani classical singer. Day 2 had a meditative musical performance by Wang Fei from China and Bahman Panahi from Iran interspersed with talks on movement therapy by Dr Marcow Vivien Speiser from Lesley University, USA. Highlighting how music, dance and vital therapeutic practices in traditional systems of healing can combine to meet lifestyle challenges of today, the Four-day Festival went off to a flying start. A spate of stories came, regaling the audience, befittingly starting with the Mrs. Sheila Dixit, Chief Minister of NCR, Delhi. The opening oeuvre was a performance by Kazak State Akademik Folk and Ethnographical Orchestra. Coming from Kazakstan, the young conductor brought out from the ensemble an amazing blend of rhythms. The festival saw a wide representation of artistes from all across India. 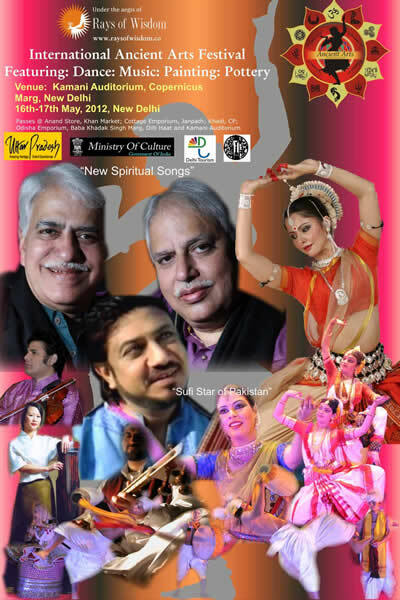 The 2 day festival/symposium was organized on 10th-11th April,2010 at Azad Bhawan Auditorium, New Delhi, India, to promote and propagate ancient cultural heritage and to rekindle spirituality in the individual and thereby society. The festival combined talks and performances in a novel manner and featured a varied range of folk and classical performances across the globe. It gave the audience a rare opportunity to understand the benefits, significance and nuances of various art forms form art scholars. The highlight of the festival was a performance by Irish artist, Thomas Sullivan.